Admiral John Byng was baptized on this date in 1704. His birth date is not known. 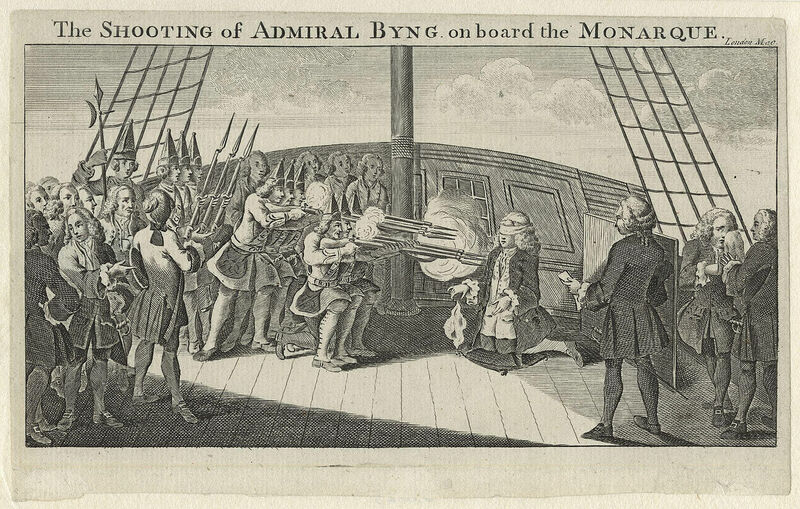 Byng has gone down in history as the British admiral who was executed on his own quarterdeck for failing “to do his utmost” in the defense of Minorca, giving rise to Voltaire’s sardonic comment in Candide, “Dans ce pays-ci, il est bon de tuer de temps en temps un amiral pour encourager les autres.” I’ll get to that in a minute. First some background. 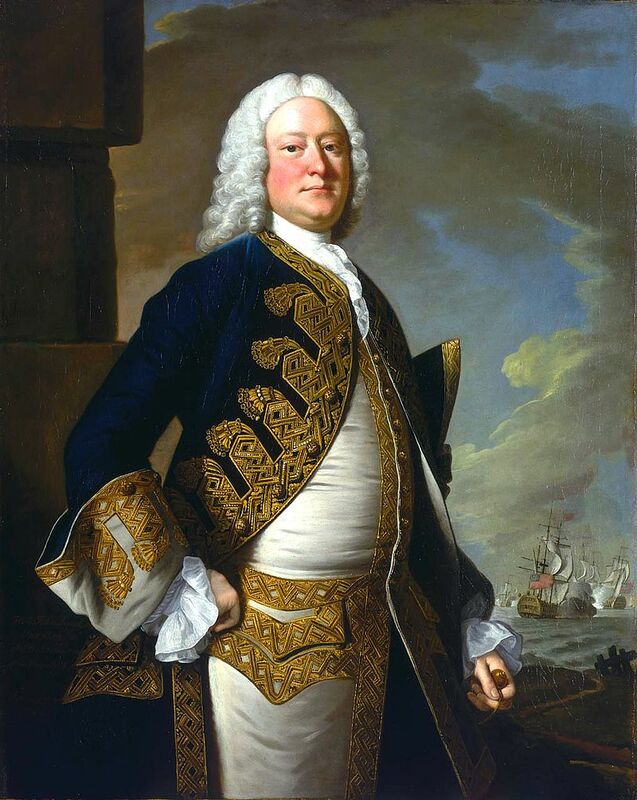 John Byng was born in the village of Southhill, Bedfordshire, in England, the fifth son of Rear-Admiral Sir George Byng (later Admiral of the Fleet).He entered the Royal Navy in March 1718, aged 13, when his father was a well-established admiral at the peak of a uniformly successful career. George Byng had supported King William III in his successful bid to be crowned King of England in 1689 and had seen his own stature and fortune grow. He was a highly skilled naval commander, had won distinction in a series of battles, and was held in esteem by the monarchs whom he served. In 1721, he was rewarded by King George I with a viscountcy, being created Viscount Torrington. Early in his career, John Byng was assigned to a series of Mediterranean postings. In 1723, at age 19, he was made a lieutenant, and at 23, rose to become captain of HMS Gibraltar. His Mediterranean service continued until 1739 and was without much action. In 1742, he was appointed Commodore-Governor of the British colony of Newfoundland. He was promoted to rear-admiral in 1745, and to vice-admiral in 1747. He was Member of Parliament for Rochester from 1751 until his death. The island of Minorca had been a British possession since 1708, when it was captured during the War of the Spanish Succession. On the approach of the Seven Years’ War, it was threatened by a French naval attack from Toulon, and was invaded in 1756. Byng was serving in the Channel at the time and was ordered to the Mediterranean to relieve the British garrison of Fort St Philip, at Port Mahon. Despite his protests, he was not given enough money or time to prepare the expedition properly. His fleet was delayed in Portsmouth for five days while additional crew were found. By 6 April, the ships were sufficiently manned and put to sea, arriving at Gibraltar on 2 May. Byng’s Royal Marines were landed to make room for the soldiers who were to reinforce the garrison, and he feared that, if he met a French squadron, he would be dangerously undermanned. His correspondence shows that he left prepared for failure, that he did not believe that the garrison could hold out against the French force, and that he was already resolved to come back from Minorca if he found that the task presented any great difficulty. He wrote home to that effect to the Admiralty from Gibraltar, whose governor refused to provide soldiers to increase the relief force. Byng sailed on 8 May 1756. Before he arrived, the French landed 15,000 troops on the western shore of Minorca, spreading out to occupy the island. On 19 May, Byng was off the east coast of Minorca and endeavored to open communications with the fort. The French squadron appeared before he could land any soldiers. The Battle of Minorca was fought on the following day. 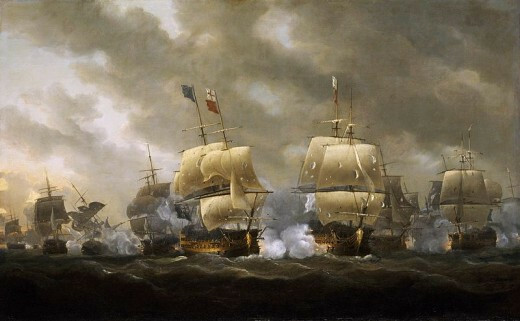 Byng had gained the weather gage and bore down on the French fleet at an angle, so that his leading ships went into action while the rest were still out of effective firing range, including Byng’s flagship. The French badly damaged the leading ships and slipped away. Byng’s flag captain pointed out to him that, by standing out of his line, he could bring the center of the enemy to closer action, but he declined because Thomas Mathews had been dismissed for so doing. Neither side lost a ship in the engagement, and casualties were roughly even, with 43 British sailors killed and 168 wounded, against French losses of 38 killed and 175 wounded. Byng remained near Minorca for four days without establishing communication with the fort or sighting the French. On 24th May, he called a council of his captains at which he suggested that Minorca was effectively lost and that the best course would be to return to Gibraltar to repair the fleet. The council concurred, and the fleet set sail for Gibraltar, arriving on 19th June, where they were reinforced with four more ships of the line and a 50-gun frigate. Repairs were effected to the damaged vessels and additional water and provisions were loaded aboard. Before his fleet could return to sea, another ship arrived from England with further instructions, relieving Byng of his command and ordering him to return home. On arrival in England he was placed in custody. Byng had been promoted to full admiral on 1 June, following the action off Minorca but before the Admiralty received Byng’s dispatch giving news of the battle. The garrison resisted the Siege of Fort St Philip until 29th June, when it was forced to capitulate. Under negotiated terms, the garrison was allowed passage back to England, and the fort and island came under French control. Byng’s failure to relieve the garrison at Minorca caused public outrage among fellow officers and the country at large. Byng was brought home to be tried by court-martial for breach of the Articles of War, which had recently been revised to mandate capital punishment for officers who did not do their utmost against the enemy, either in battle or pursuit. The revision followed an event in 1745 during the War of the Austrian Succession, when a young lieutenant named Baker Phillips was court-martialed and shot after his ship was captured by the French. His captain had done nothing to prepare the vessel for action and was killed almost immediately by a broadside. Taking command, the inexperienced junior officer was forced to surrender the ship when she could no longer be defended. The negligent behavior of Phillips’ captain was noted by the subsequent court martial and a recommendation for mercy was entered, but Phillips’ sentence was approved by the Lords Justices of Appeal. This sentence angered some of parliament, who felt that an officer of higher rank would likely have been spared or else given a light punishment, and that Phillips had been executed because he was a powerless junior officer and thus a useful scapegoat. The Articles of War were amended to become one law for all: the death penalty for any officer of any rank who did not do his utmost against the enemy in battle or pursuit. Byng’s court martial was convened on 28th December 1756 aboard the elderly 96-gun vessel HMS St George, which was anchored in Portsmouth Harbour. The presiding officer was Admiral Thomas Smith, supported by rear admirals Francis Holburne, Harry Norris and Thomas Broderick, and a panel of nine captains. The verdict was delivered four weeks later, on 27th January 1757, in the form of a series of resolutions describing the course of Byng’s expedition to Minorca and an interpretation of his actions. The court acquitted Byng of personal cowardice. 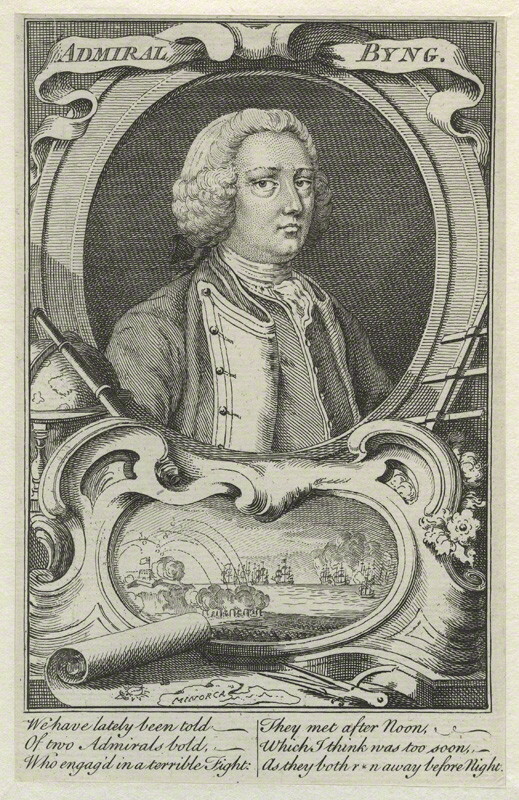 However, its principal findings were that Byng had failed to keep his fleet together while engaging the French; that his flagship had opened fire at too great a distance to have any effect; and that he should have proceeded to the immediate relief of Minorca rather than returning to Gibraltar. 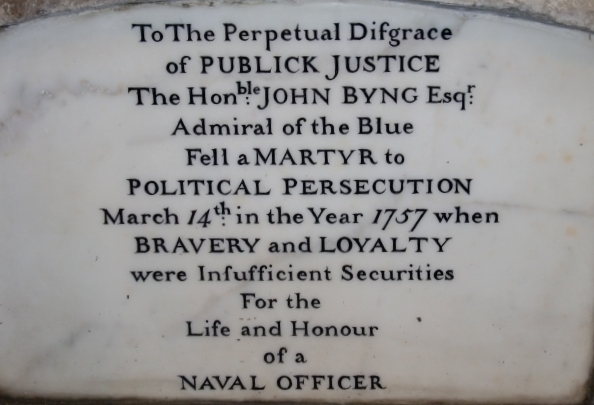 As a consequence of these actions, the court held that Byng had “not done his utmost” to engage or destroy the enemy, thereby breaching the 12th Article of War. Once the court determined that Byng had “failed to do his utmost”, it had no discretion over punishment under the Articles of War. In accordance with those Articles the court condemned Byng to death, but unanimously recommended that the Lords of the Admiralty ask King George II to exercise his royal prerogative of mercy. First Lord of the Admiralty Richard Grenville-Temple was granted an audience with the King to request clemency, but this was refused in an angry exchange. Four members of the board of the court martial petitioned Parliament, seeking to be relieved from their oath of secrecy to speak on Byng’s behalf. The Commons passed a measure allowing this, but the Lords rejected the proposal. The King did not exercise his prerogative to grant clemency. Following the court martial and pronouncement of sentence, Admiral Byng had been detained aboard HMS Monarch in the Solent and, on 14th March 1757, he was taken to the quarterdeck for execution in the presence of all hands and men from other ships of the fleet in boats surrounding Monarch. The admiral knelt on a cushion and signified his readiness by dropping his handkerchief, whereupon a squad of Royal Marines shot him dead. Byng’s execution was satirized by Voltaire in his novel Candide. In Portsmouth, Candide witnesses the execution of an officer by firing squad and is told that “Dans ce pays-ci, il est bon de tuer de temps en temps un amiral pour encourager les autres” which is usually translated as, “in this country, it is good to kill an admiral from time to time, in order to encourage the others.” This has, in fact, gone down as a painfully inadequate translation, especially of “pour encourager les autres.” The French (and the original English) verb means “to make more courageous” but the English verb has changed in meaning to become “to urge on.” Hence the phrase is ridiculously mistranslated, but, in some ways, even funnier. Instead of being a wry comment, it is farcical. After all, the actual intention of the 12th Article of War was to prevent inaction, or ineffective action, in the face of danger. Bedfordshire clanger immediately sprang to mind for today’s recipe. First, the Byng family holds estates in Bedfordshire and Byng was born there and buried there. Second, we have a horrible pun. A “clanger” in Britspeak, for those who don’t know, is a terrible mistake. We can argue who dropped a clanger here, Byng or the government, but “someone had blundered.” The Bedfordshire clanger is one of those dishes that labors under numerous misconceptions because the general public has an endless need to repeat falsehoods that sound like they ought to be right. 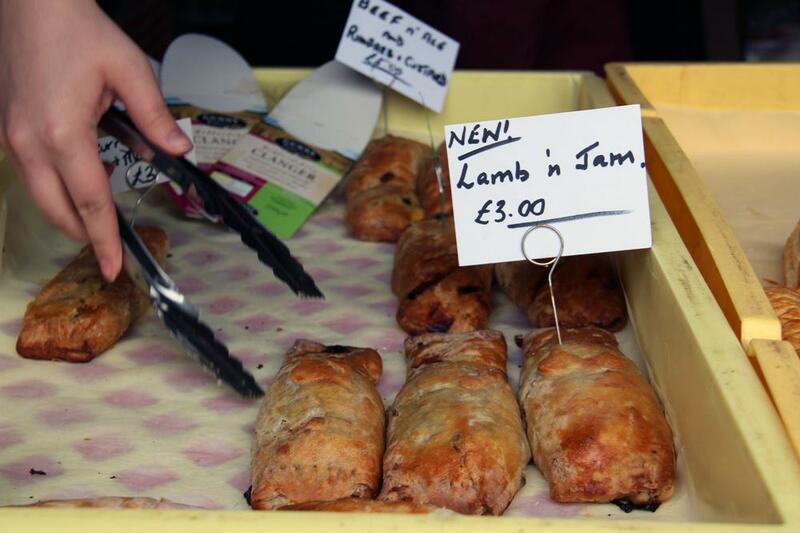 The Bedfordshire clanger is a suet pastry roll with a savory filling at one end and a sweet filling at the other that was originally made at home to be taken into the fields by farm workers for their midday meal: meat and pudding in one package. I believe that one end was probably Sunday leftovers or simply potatoes and other vegetables and a little jam at the other end. It was more often than not boiled rather than baked, so that it was a filled suet pudding, but nowadays you’d be hard put to find a boiled one. I’ll have a go at the original one day. It is also said that the crust was not eaten because the workers would get it dirty with hands that had worked in the fields all day. I find this claim patently laughable. Workers carried their clangers in napkins which they could use to hold them while they ate to protect them from dirty hands, and the idea that a 19th century agricultural laborer was so dainty that he wouldn’t want any dirt on his food is absurd. I suspect that this bit of folklore has been transferred to the clanger from the Cornish pasty which was also occasionally made with sweet and savory ends and was taken down tin mines by the miners for their meal. They might have been more fussy about eating the pastry of a pasty soiled with toxic mine dust, but I doubt this also. Why would miners’ or farm workers’ wives go to all the trouble of making a suet pastry daily only to have it thrown away? If you ate only the filling of a clanger (especially as made these days) you’d go hungry for the afternoon. I wish people would use their brains once in a while when repeating such idiocies. This recipe uses fruit rather than jam, but you can really use any fillings you want. For the meat filling: heat half the vegetable oil in a heavy skillet and gently cook the onions for two to three minutes until soft and translucent. Remove from the pan and set aside. Heat the pan again over a high heat, add the rest of the vegetable oil, season and add the chopped meat. Brown on all sides Remove the meat from the pan and mix with the onions. Add a cup of stock to the pan together with the Worcestershire sauce, and boil until you have only two to three tablespoons left, then add the meat and onions back to the pan and cook over a high heat until the sauce has reduced until it is just coating the meat. Remove from the heat and leave to cool. Preheat the oven to 200˚C. Meanwhile, make the pastry: mix the flour, salt, suet and grated butter with your fingers into a fine breadcrumb-like consistency. Mix in about 150-160ml water and the beaten egg to form a smooth dough and knead it for a minute. Roll the pastry on a floured table to about 1/2cm thick and cut into rectangles about 12-14cm long by 8cm wide, then brush the edge of the long end with beaten egg. Retain any of the pastry cut-offs. Next, spoon the meat filling in one half and the chopped pears into the other, using a little piece of molded spare pastry to separate the two in the center. Roll the pastry over into a large sausage roll shape, folding over the ends, place on a lightly greased or non-stick baking tray and brush with the beaten egg. Mark the sweet end with two short slashes so that you can tell sweet and savory apart. Bake for 45 minutes, or until the pastry is golden.